Can a tree ever make you blind or cause blisters on your skin? Q. Can a tree ever make you blind or cause blisters on your skin? Ans. 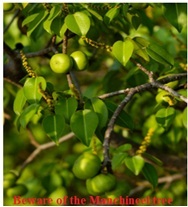 Yes, the Manchineel tree which finds a mention in the Guinness World Record for “World’s Most Dangerous Tree” surely does so. The tree is native to tropical southern North America and northern South America. Its sap is so acidic that a mere contact with human skin causes the skin to blister and can cause blindness if it gets into the eyes of a person. Even standing under the Manchineel tree during rain is enough to cause blisters if the skin is wetted by raindrops containing any sap. Smoke from burning Manchineel wood can cause blindness if it reaches a person’s eyes. The fruit of the tree adds to its deadly nature and is rightly named as “Death Apple” because even a small bite results in ulceration of the mouth and esophagus causing severe pain. Previous Article Are you aware of the injurious effects of using headphones/earphones for long hours? Next Article The tail of a kangaroo is almost its ‘fifth leg’. But how?